Here is my first new recipe since discovering that I am allergic to eggs, almonds, and possibly dairy products. (The jury is still out on some dairy, but for now, it’s off limits.) It cheered me up immensely that these were so good. This is my new reality, but food allergies are so common now that it is probably a good idea to include options for customizing when writing recipes anyway. So whatever diet you follow, Paleo, Primal, Atkins, LC/HF (low-carb/high-fat), gluten-free, vegetarian, vegan, or almost any other plan, you can have really tasty cookies! I tested the recipe using the ingredients listed first, but the recipe is very forgiving and almost everything can be replaced with something similar. 2 cups add-ins, such as: sugar-free chocolate chips, chopped pecans or other nuts, pumpkin or sunflower seeds, large-flake, dried coconut, cocoa nibs, dried cranberries, raisins, currents, or any combination. Preheat oven to 350°F. Grease two cookie sheets or line with parchment and grease parchment. In bowl of food processor, place egg or prepared egg substitute of choice, liquid sweetener, bulk sweetener, and vanilla extract. Process until smooth. In a large bowl, combine flours, baking soda, and salt and stir to blend. Add dry ingredients to food processor and pulse until well combined and smooth, scraping down container once or twice. Stir add-ins into dough with a few quick pulses or by hand until evenly distributed. Scoop rounded tablespoon-sized mounds of dough onto prepared cookie sheets. Leave 1 or 2 inches between cookies to allow for spreading. Bake 12 minutes, or until lightly browned. Allow to cool completely on cookie sheet. Store cookies in an airtight container and refrigerate or freeze. Cookies can be frozen on cookie sheet before placing in a container. Counts are for cookies made with the first ingredients in list with 1 cup flaked coconut, ½ cup sugar-free chocolate chips, and ½ cup chopped pecans. Count will vary with alternate choices. *You can make flour from nuts and seeds by combining them with the other dry ingredients in a food processor and pulsing until fine. Stop between every few pulses so they don’t overheat. Freezing the nuts before processing makes them easier to turn into flour. Before you resort to egg replacements, you might want to try other kinds of eggs. Quail eggs are often available in Asian markets or with the Asian foods in regular groceries. Local produce stands sometimes sell duck, goose, and turkey eggs. I have heard good things about this egg replacement powder.. I have some on order, but have not used it yet. It contains, potato starch, tapioca flour, leavening (calcium lactate, calcium carbonate, cream of tartar), cellulose gum, and modified cellulose. It has 4 grams of carbohydrate, no fat, and 15 calories in 1½ tsp (4 grams by weight), the amount needed to replace one egg. The website is here. Whisk together until foamy before using in recipes. 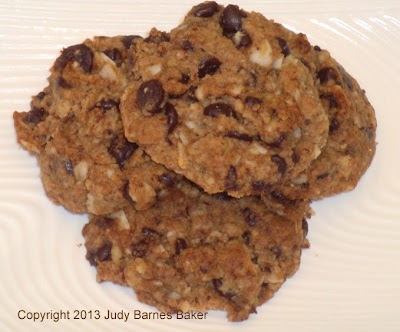 Can be dairy-free and egg-free, Cookies that can be customized. Bookmark. 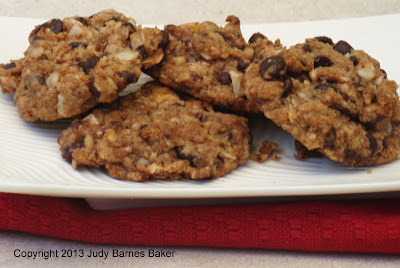 These cookies sound like they would be fun to make on a Saturday afternoon, before movie night! Thanks!I will share your recipe with the Singles With Food Allergies' community. Thanks for the comment, Matty. Sounds like a fun group! Judy, these sound awesome! I am so happy for you that you are finding a workaround the allergies to still make great cookies and other things. Pies should not be a problem, gelatin desserts, etc. Some things like cookies and muffins and cakes have to be reworked, but you will help so many other people in the process. Can't wait to make and eat these beauties. Thanks for all your hard work. These sound absolutely delicious, Judy. Just printed it out to give them a try soon. Will make a lovely addition to my holiday cookie tray! Thanks for the suggestions, Jennifer! I made a nice pudding for lunch today that has potential and am working on an "apple pie" recipe. It will take a while since many of my usual low-carb tricks won't work now. Thanks for the comments, Ditamac and buttoni! I'd love to have your feedback–especially if you try some of the alternate ingredients. These were absolutely phenomenal! Will be making often. Thanks, Marsha Fields! Glad you liked them. Hello! I would love to make these. Confused by this: "liquid sugar substitute to equal to 3/4 cup sugar." Can you give examples of an appropriate sweetener to use? Thank you so much! I specified liquid sweetener so it wouldn't add carbs, just additional sweetness. You can use any kind you like, such as stevia, sucralose, or monk fruit, but you could probably just use more of a bulk sweetener, although they are usually more expensive.